It looks like Brunson has a change of mind and wants to again get back into the thick of the action and that he loves. The Hall of Famer has won 10 WSOP bracelets in his illustrious career of poker. 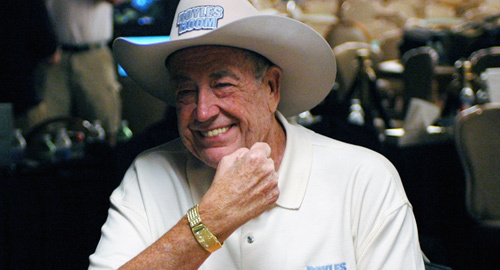 It looks like the 83-year -old veteran is looking to add another WSOP bracelet to his kitty. Brunson is still active and playing the Las Vegas high stakes cash games. He prefers this kind of games rather than taking part in long tournaments. But, this is all set to change as he had announced on Twitter that he wants to return to the big league. He is looking to get one up over his other poker friends as far as WSOP bracelets are concerned. He, along with Phil Ivey and Johnny Chad are tied at 10 bracelets in the all-time bracelet list. The leader of the pack with 14 bracelets is Phil Hellmuth. Brunson has a long way to go if he has visions of chasing the target set by Phil. It would be a real icing on the cake for Brunson if he manages to play at the 2017 WSOP event. It is slated to begin at Rio on May 30. Brunson has expressed his desire to play in all the $10,000 events. There are 15 $10,000 events on the schedule for this year. All this will depend on his wife’s health issues though. Brunson himself has been fighting skin cancer and has survived many cases of this dreaded disease.